An X-ray tube is basically a vacuum tube that produces X-rays, which are used in X-ray machines. X-rays are part of the electromagnetic spectrum, an ionizing radiation with wavelengths shorter than ultraviolet light. X-ray tubes evolved from experimental Crookes tubes with which X-rays were first discovered in the late 19th century. The discovery of this controllable source of X-rays created the field of radiography: the imaging of opaque objects with radiation that penetrates. X-ray tubes are also used in airport luggage scanners, CAT scanners, X-ray crystallography and for industrial inspection. As with any other type of vacuum tube, there is a cathode, which emits electrons into the vacuum and an anode to collect the electrons ─ creating a flow of electrical current, known as the beam, through the x-ray tube. A high voltage power source is connected across the cathode and the anode to accelerate the electrons. The X-ray spectrum depends on the anode material and the accelerating voltage. In many applications, the current flow is able to be pulsed on for between approximately 1ms to 1s. This allows for consistent doses of x-rays, and taking snapshots of motion. Until the late 1980s, X-ray generators were merely high-voltage, AC to DC variable power supplies. In the late 1980s a different method of control emerged, which became known as high-speed switching. This followed the electronics technology of switching power supplies (also known as switch mode power supply), and allowed for: more accurate control of the X-ray unit, higher-quality results, and reduced exposure to X-ray. Electrons from the cathode collide with the anode material, usually tungsten, molybdenum or copper, and accelerate other electrons, ions and nuclei within the anode material. About 1% of the energy generated is emitted/radiated, usually perpendicular to the path of the electron beam, as X-rays. The rest of the energy is released as heat. 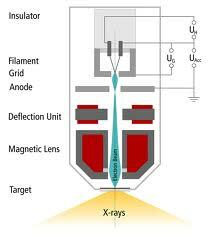 Over time, tungsten is deposited from the target onto the interior surface of the x-ray tube, including the glass surface. This slowly darkens the tube and was thought to degrade the quality of the X-ray beam, but research has suggested there is no effect on the quality. Eventually, the tungsten deposit becomes sufficiently conductive that at high enough voltages, arcing occurs. The arc jumps from the cathode to the tungsten deposit, and then to the anode. The arcing causes an effect called "crazing" on the interior glass of the X-ray window. As time goes on, the tube becomes unstable even at lower voltages, and must be replaced. At this point, the x-ray tube assembly (also called the "tube head") is removed from the X-ray system, and replaced with a new tube assembly. The old tube assembly is shipped to a company that reloads it with a new, replacement X-ray tube. The range of photonic energies emitted by the system can be adjusted by changing the applied voltage, and installing aluminum filters of varying thicknesses. Aluminum filters are installed in the path of the X-ray beam to remove "soft" (non-penetrating) radiation. The numbers of emitted X-ray photons or doses are adjusted by controlling the current flow and exposure time. In simple terms, the high voltage controls X-ray penetration, and thus the contrast of the image. The tube current and exposure time affect the dose and consequently, the darkness of the image. Some x-ray examinations (such as: non-destructive testing and 3-D microtomography) need very high-resolution images and therefore require x-ray tubes that can generate very small focal spot sizes, typically below 50 µm in diameter. These tubes are called microfocus x-ray tubes. There are two basic types of microfocus x-ray tubes: solid-anode x-ray tubes and metal-jet-anode x-ray tubes. Solid-anode microfocus x-ray tubes are in principle very similar to the Coolidge tube, but with the important distinction that care has been taken to focus the electron beam into a very small spot on the anode. Many microfocus x-ray sources operate with focus spots in the range 5-20 µm, but in rare cases spots smaller than 1 µm may be produced. The major drawback of solid-anode microfocus x-ray tubes is the very low power in which they operate. To avoid melting of the anode, the electron-beam power density must be below a maximum value. This value is somewhere in the range 0.4-0.8 W/µm depending on the anode material. This means that a solid-anode microfocus source with a 10 µm electron-beam focus can operate in the range 4-8 W.
In metal-jet-anode microfocus x-ray tubes, the solid metal anode is replaced with a jet of liquid metal, which acts as the electron-beam target. The advantage of the metal-jet anode is that the maximum electron-beam power density is significantly increased. Values in the range 3-6 W/µm have been reported for different anode materials (gallium and tin). In the case with a 10 µm electron-beam focus a metal-jet-anode microfocus x-ray source may operate at 30-60 W.
The major benefit of the increased power density level for the metal-jet x-ray tube is the possibility to operate with a smaller focal spot to increase image resolution, and at the same time acquire the image faster, since the power is higher (15-30 W) than for solid-anode tubes with 10 µm focal spots. MedWOW’s inventories feature X-Ray tubes from most of the major manufacturers including: Shimadzu, Varian, Dunlee, Fischer Imaging, GE Healthcare, Philips, Siemens, Picker and Raymed, with more being added all the time, so finding exactly what you need is efficient and simple for busy medical professionals. With dozens of types of x-ray tubes currently featured through MedWOW’s comprehensive online catalogue ─ finding and purchasing your next x-ray tube is trouble- free and as thousands of medical professionals use the MedWOW portal on a daily basis, the prices are always competitive.